A year has past since the final battle with Moo, but Genki is unable to forget about his friends. He's led to an empty shop by an image of Moochi where he finds a Monster Rancher game disc. 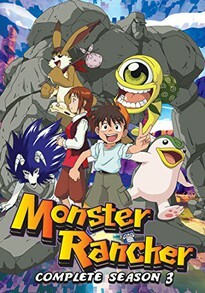 Back inside the world of Monster Rancher, Genki and the gang reunite to try and seal Moo away forever. They meet up with Hare, who has been living with Tama. Tiger tries to recover his lost abilities and compete in the Mandy Cup Challenge. General Durahan continues to send monsters after the gang. Meanwhile, they try and make it to the International Monster Association to register for the Legend Cup. Will they unlock the mystery disc and put Moo away forever? Contains all 26 episodes of season 3.